Lost amid a myriad dialogues about the trying, even apocalyptic times we are in, is an appreciation of just how beautiful and powerful we, this entire collective of Souls on Earth, are. Yet, they shun responsibility for the policies that they enact on our behalf, claiming powerlessness to follow anything but the self-serving, arcane “rules” (laws) that control them. This is all part of a grand fairytale that we’ve been unwitting witnesses to, and actors within. Our health care mess, War on Terror, Federal Reserve system and the National Debt, are all examples of how we’ve allowed our lust for money supersede policies that reflect and embody a love and respect for each other. It’s more of a “grim” fairytale because many people are suffering the ill-effects of the adoption of long-standing “self-evident” truths that appear to benefit a small few. But I assert that humanity is beautiful and powerful. We are compelling evidence that anything we can think, is being done; is being experienced by someone, somewhere. And if an idea isn’t being experienced presently, it can be eventually, at some future time. If an idea serves a purpose, a human, or group of humans, will imagine it into being. The purpose that the idea serves doesn’t have to make sense to you or me, but it is a perfect expression of gross effect that is spawned from subtle cause, the immeasurable nothingness and emptiness of a thought or idea. 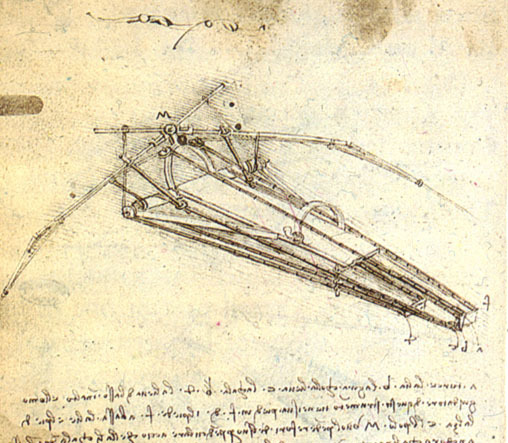 While he is heralded as one of the greatest artists in all of history, Leonardo da Vinci (1452-1519) imagined the advent of flying machines 400 years before the Wright Brothers took their historic flight at Kitty Hawk. In a scant 100 years since then, we are now imagining manned journeys to distant planets of the solar system and beyond. Clearly, there is power in imagining. It is also clear that a large portion of the human population uses its imagination unconsciously, with little awareness of its—or their—true power. Leonardo had no more power to imagine, or to create than any other human being living on the planet today, any that has ever lived, or ever will. The question is, how do we use this power called imagination? What do we imagine? Not only about ourselves, but about our world? And how does what we imagine about ourselves affect the world around us? There are some who think that individually, we are of little to no consequence in the larger scheme of things. I tend to differ. The idea that our imagination is of little consequence provides no incentive to take greater notice. When persistent fears become recurring experiences, we don’t see the connection. When authorities take steps to limit our freedoms on the logic that they are “protecting” our safety, we blindly imagine the worse outcomes that they conjure up, supported by media coverage in newspaper and magazine articles, broadcast news, motion pictures, fictionalized dramatizations and video games. We allow them to send our children into zones of war, where hostilities and enmity is escalated and death tolls mount, instead of diffusing contentious ideas that have persisted for centuries. Young soldiers are taught to “follow orders” and “shoot to kill” to protect life, liberty, and property. They will kill, confine, imprison, and destroy in order to do so. So “the game” has gone. I believe that if we master ourselves, we can transform the world. This is why the Powers That Be have attempted, best they could, to keep you in question and doubt as to whether you can trust, and therefore be responsible for, your own judgment, unafraid of any other. This is why we’re encouraged to be fearful, an oxymoron if I ever heard one. If keeping people in the dark about who they are is the goal, fear is the only way to go. We are encouraged to fear loving and God (an omnipotent Supreme Creator that is separate from, and judgmental of us). We’re advised to worry about what He’ll do to us if we don’t satisfy the conditions and stipulations, and jump through the hoops that His intercessors have put before us to appease Him. This God, mind you, is the Essence of Love, which has no reason to withhold Itself from anyone, any more than the sun would choose to shine on some while refusing its light to others, or gravity would selectively apply, or limit, its force. Some ideas, in their purest, highest expression, are unconditional. They are also eternal. Love is one such idea. The intent of love, irrespective of the language spoken, is universally beneficial, harmless, courageous, nurturing, health-enhancing, and life-affirming. When we practice love in anything other than its full intention, we open ourselves to the vacuum that forms by its withholding, expressed variously as sorrow, loneliness, and despair, or aggression, anger, shame, reprisal and revenge. If we are willing to be blatantly honest, chronic illness and disease can all be traced to a time or place where love was, or is still being withheld, which reduces one’s joie de vivre, progressively and cumulatively, and hence, one’s reasons to live. Love is a reason to live, because love is life. To take away love, or to refuse to give it, is to suffer a little death within. We do this not knowing that the solution to our perceived problems in life (and love) is to give to others what we feel we want to add to our lives. If we seek love, joy, or peace in our lives, we should give it unconditionally, as the option is always present. It’s hard—I’d even say impossible—to hold on to “hard feelings” when you’re giving love. When we’re withholding love, compassion, or genuine care for another, we don’t realize that we’re also withholding these energies and feelings from ourselves. When we feel vulnerable and victimized, we take our own immune system down, because we’re less enlivened in ways that only being in love can do. This doesn’t mean being in love with another, but simply within the coherent, harmonic energy field that is the sphere of love. Loving another does not mean condoning, or agreeing with all that another does. It means remaining balanced and coherent within one’s self, true to who and what we are. Being unconditionally loving is to instigate, in other words, to intend no new harm. We cannot walk into a situation bearing a weapon of mass or self-destruction, and say that we didn’t intend any harm. Only by being harmless and fearless under all circumstances would such truth be confirmed. This does not mean cowering passivity in the face of the threat of death. However, a courageous commitment to balanced, harmonious life can do wonders. Any love withdrawal that may have resulted in acrimony or harm can be healed through love’s restoration. We have tried sending money in the place of love, and all the practice has done is escalate the perceived danger index. Far more that is joyful can be accomplished between friends, than can ever be imagined as enemies. These are easy concepts to dismiss, as one could cite the escalating dangers in the world, but doing so wouldn’t diminish their truth. The Powers That Be want you to celebrate the elimination of an “enemy” while enmity between groups is increased; “Ask your doctor,” your pastor or priest, peer review committee, or anyone else to whom you can hand your imaginative power over to, and not KNOW that you are beautiful and powerful beings, and said power to imagine is yours to give, and that it is YOU who are giving it. If you love how you imagine your life unfolding, and live said life each day in that spirit, your life will unfold accordingly. This is how the game continues, and how it can change as you change. For these reasons, you won’t read much in the way of dire future predictions coming from me. This is not because I have mastered the art of love (although it is certainly my desire and intention), but I do appreciate its power, especially when it comes to the conscious use of our imagination. Being fearful represents the unconscious use of imagination. Being loving is the conscious use. Choosing to love, in spite of the “logical” reasons to be fearful, opens the heart, expands the consciousness, and evolves the being to a new level of possibility. It brings the imagined world into being in ways that fear can and will never do. IF we want to see a different outcome to the dire apocalyptic scenarios that some people are suggesting, we have to imagine differently, and exercise all the qualities that go with the new intention—e.g., patience, tolerance, forgiveness, compassion, courage, and gratitude. This doesn’t mean that dire events will not occur, but it is unwise to allow the fear of them to give them energy, and override one’s sense of what is best, and loving. It appears to be a truism that if you can conceive or imagine an idea—good, bad, or indifferent—it is. When much of the information sent across public airwaves is either mindless or laced with fear, it’s easy to see how our evolution as a species might appear to be in question. But I believe the true jeopardy is in appearance only, because each Soul is both beautiful and powerful, and an expression of, and from the same Source. There does not appear to be a power problem, where one “force” is stronger than the other. There simply appears to be a persistent predominant belief in duality, which I believe we’re in the process of learning doesn’t really exist. Duality, the idea of separateness and contrast, can express as what we might term, oppositionism, or the proclivity to seek to “win” or prevail (not “lose”) over our “opposition,” via eradication, after convincing ourselves that our imagined “good” is more worthy to exist than their imagined “evil,” even if we must do inhumane, “evil” acts in order to eradicate the inhumane evil force. Because we see duality as real, we become “dividable,” and therefore, “conquerable.” Thinking that cancer tumors are evil, malignant forces that invade our bodies, we remain oblivious to the unbalanced environment and imaginings that we mindlessly maintain. We agree to treatment methods that make the environment even more toxic, as well as maintain our fearful, oppositional thinking. When these methods kill us, or those we unloved (or unloved us), we mourn. But what if it was all unnecessary? What if we can change this pattern through a simply shift to more loving consciousness? Seeing beauty and power in everyone, meaning in all of humanity, tends to throw a damper on the idea that anyone, or anything is only a force for evil (and we’re only forces of good), even if we don’t find a resonance with their position or actions. Their existence means that a purpose is being served, which will be perpetuated by fear, or transmuted by love. But then, that is the appearance. Anyone who is motivated to take the loving road less traveled, to seek, find, and know truth that emanates from their own heart, will find the way… their way. The Path to freedom, health, abundance, and vitality, is the path of Love, and is always available when one is ready. Adam, I am SO glad I finally got around to reading this post this morning…I saw it a few days ago, was “hooked” by the title, but never had a good block of time to sit and read it properly. You have, as Deus Ex Machina commented, captured and articulated ideas that I, too, firmly believe in. Over the last year, I have seen first hand what the power of love can achieve – through health, finances, relationships… It is so easy to be, or become, fearful in times when the media is full of tragic news, with each week bringing more news of suffering, or worrisome news, or even statements from the Powers That Be that are meant to show us they have everything under control – when in fact they are only trying to control more and more. This is a great article. We all have an inner intelligence in our bodies, every cell in us have a universal inner intelligence, like the flower turns towards the Sun, and follow the Sun, and the birds sit on the eggs, and the trees show their blooms in the spring.The body will also heal it self, as long as we know to give it the right nutrients, water, and minerals, and the right thoughts and allow the right conditions. Excellent post, Adam. So many people shrug off these ideas because it is easier to go along with the masses. I believe you have clearly articulated what I often have difficulty explaining. This is the path out of this “zombie culture” to the emergence of the new human.